Most of us have crashed on bikes but fewer know or have experienced how severe bike crashes can really be. Bicycle crashes can result in permanent, catastrophic injury, brain damage, or wrongful death. It is important in these cases to understand your legal rights and how to recover from the accident financially. Bike accidents happen in many different ways and sources of liability differ with the accident. Whether you’re a San Francisco bike messenger, recreationalist, professional cyclist, or beginner, you have rights and responsibilities on the roadway that you should be aware of. The Bay Area bike accident attorneys at Bracamontes & Vlasak, P.C., are here to help you. Call Bracamontes & Vlasak at 415.835.6777 to schedule a free consultation today. If you have been involved in a bike accident in California, you should consult an attorney immediately to understand the process of recovering from the loss financially. If a car hit you or someone “doored” you while you were riding by, and the driver’s insurance offers to pay out quickly for a full release of liability, you should beware. Never trust that insurance companies are looking out for you. Most of the time, they are trying to save all the money they can. It is also very important before taking a settlement to know the details and policy limits of the insurance policies applicable to the accident, as well as what personal assets the driver may have. These insurance issues can be complex and you should consult an injury attorney to advise you. Also, never settle without knowing the full extent of your injuries. You might think that if you have medical insurance that pays for your treatment from the bike accident you cannot recover your medical bills from the other side. That is false. The collateral source rule in California allows you to recover money your own insurance paid out for your hospital bills. Also, insurance won’t always pay for all damages that can be recovered in a lawsuit, such as lost wages, loss of future earning capacity, loss of consortium, future medical treatment, pain and suffering, and so on. It is important that you find an attorney to represent you if you have crashed on a bike and have suffered severe injuries, because the right attorney will maximize your recovery. You will want an attorney that thoroughly understands insurance and the litigation process. Physicians are of course the most qualified to determine what injuries you have sustained in your bike crash and what treatment is needed. However, it is often important to have a good personal injury attorney on your side to ensure that you are receiving the best and most thorough treatment available. A good personal injury attorney will also hire the right expert doctors to determine the nature and extent of your injuries to maximize your recovery. Often bike crashes happen without cars involved. That does not always mean there’s no one to sue. People always crash for a reason, and often it’s because of a dangerous condition of the roadway or some other condition that makes accidents more likely. In those cases, you may have a case against the city or state for negligence in maintaining the road or for improper signage. Also, the California Vehicle Code gives rights to bicyclists that you should be aware of before ruling out a lawsuit. The bike accident lawyers at Bracamontes and Vlasak understand what it takes to obtain the compensation you deserve after a bicycle accident in the East Bay or greater Bay Area. The process of recovering physically and financially from a serious bike accident can be challenging. The lawyers of BV Law ease your recovery process by fighting vigorously to get you the best possible result. 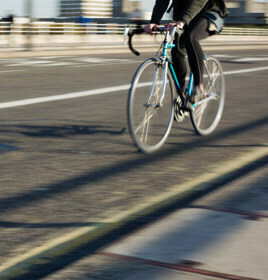 Contact a San Francisco attorney at Bracamontes & Vlasak today for a free consultation about your bicycle accident. You can also reach us by telephone at 415.835.6777.